If the relative popularity of a band is gauged by Facebook likes nowadays, with over 437,000 I’ll assume that most of you are already familiar with Washington D.C.’s progressive-avant-techmathdjenters Periphery. And with well over 120,000 themselves, their Sumerian Records labelmates Chon (from California) seem fairly widely-known as well. But we’re going to take a moment to highlight the two other bands that are rounding out the line-up of the Sonic Unrest tour that is currently underway all across these United States of America. One of them is a bit more of a newcomer to the scene, while the other has been around long enough to have attained legendary status in certain circles — but with Facebook numbers in the low-to-mid five digits for each of them, perhaps one or both of them may have managed to escape beneath your radar up until now? The Sonic Unrest Tour runs from 04 August through 01 September 2016, with a local stop in the Pittsburgh area next Saturday the 27th. The full list of dates will be listed at the end of this post, for those who may be interested. SikTh, from Hertfordshire, England, have been around since well before MySpace was even a thing. Through the early days of the twenty-first century, this progressive monstrosity struck out into bold new directions that would rank them amongst other forerunners (such as Meshuggah, for example) of today’s progressive-technical metal movement. But after two critically-lauded albums, several founding members headed off in different directions nearly ten years ago, and the band split up entirely not long afterwards. But they reformed in 2014 and have been slowly rebuilding a following through tours and festivals — and in December 2015 self-released their first new material since 2006, the crowd-funded EP Opacities. And this month — thirteen whole years since the release of their debut album — they will finally be crossing another item from their collective bucket list, which is to tour the U.S.A. Earlier this year, Spinefarm Records out Nocturnal Masquerade, the first full-length (following a couple of EPs) by Toothgrinder, from Asbury Park (home of the New Jersey Music Hall of Fame). Like the rest of the touring bands, these guys manage to put together a distinctive package that combines aggression with progression, brutality with technicality. 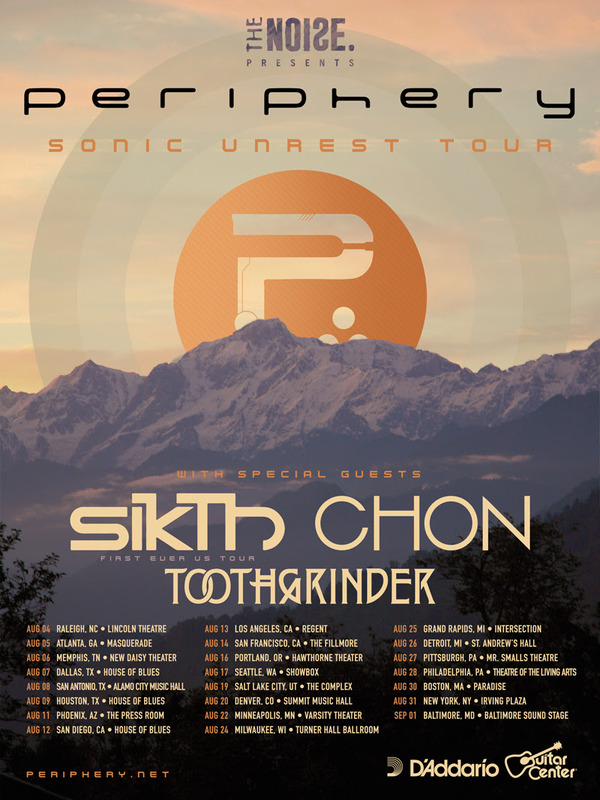 This entry was posted in Pittsburgh, Shows, Videos and tagged Chon, Justin Matthews, Meshuggah, Mikee Goodman, Mr. Smalls Theatre, Pennsylvania, Periphery, Pittsburgh, Sikth, Spencer Sotelo, Spinefarm Records, Sumerian Records, Toothgrinder, USA. Bookmark the permalink.